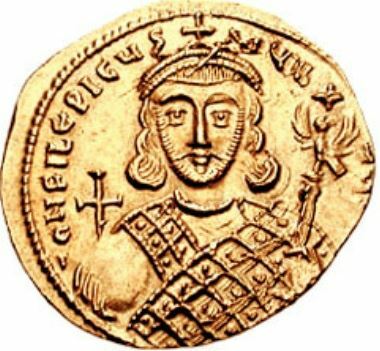 Philippikos was Emperor of the Byzantine Empire from 711 to 713. Philippicus was originally named Bardanes, and is often referred to as Philippikos Bardanes. Philippikos seized power when he successfully incited the Khazars to besiege Constantinople in opposition to Justinian II, who had returned to the throne no less harsh than he had left if when he was first ousted by Tiberios III. Among his first acts were the deposition of the orthodox patriarch Cyrus of Constantinople, in favour of John VI, a member of his own sect, and the summoning of a conciliabulum of Eastern bishops, which abolished the canons of the Sixth Ecumenical Council. In response the Roman Church refused to recognize the new Emperor and his patriarch. In May 713 the Opsikion troops rebelled in Thrace. Several of their officers penetrated the city and blinded Philippicus. He was succeeded for a short while by his principal secretary, Artemius, who was raised to the purple as Emperor Anastasius II. He died in the same year.